Before there was Brad and Angelina, or Brad and Jen, or Angelina and Billy Bob or any other Hollywood couple known only by their first names, there was Doug and Mary, the very first king and queen of Hollywood. American royalty. Mary Pickford's star rose in 1913 and she soon became the most popular actress in the world, she stayed at that pinnacle until 1930. She wasn't just popular, she was the epitome of stardom for seventeen years. There has never been an actress able to duplicate her accomplishment and in today's world where actors are old news after five years, there probably never will be. She was known as America's Sweetheart and made millions playing "the girl with the golden curls". Douglas Fairbanks was the action hero of his day. If there was a swashbuckling pirate or a mythical hero to be played, Fairbanks was there. He was the man all the ladies loved and all the men wanted to be. When Doug and Mary met in 1916, the sparks flew. 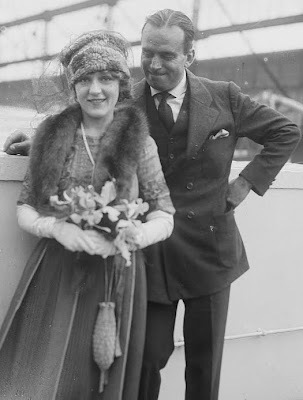 Because they each had other spouses at the time, they didn't become free to marry each other until 1920, about two weeks after Mary's divorce became final. They set up housekeeping in a Hollywood mansion they called Pickfair and it soon became the place to go when dignitaries visited America. An invitation to Pickfair was your ticket into the world of Hollywood's, and America's, elite. Shortly before their marriage, Doug and Mary also went into business together. Along with fellow actor, Charlie Chaplin and prominent director, D.W. Griffith, they formed United Artists motion picture studio. This not only enabled these four luminaries to choose which pictures they wanted to make, but gave them the means to write, produce and direct in addition to acting. United Artists became very successful and Doug and Mary became even richer and more powerful than they'd been before. What makes Doug and Mary so unusual in their world of money and success was that they had a deep love for each other, one that could not be faked for the benefit of their fans and the movie cameras. What Doug and Mary had was real. Anyone who's seen Singing in the Rain knows of the upset talking pictures created in silent era Hollywood. Though they were both wonderful, competent actors, talkies threw Doug and Mary both off their game and neither ever recovered. With a lot of energy and no way to expend it now that his movie making was greatly reduced, Douglas took to world travel, something Mary despised. She was content to spend her time quietly at Pickfair, ruling her kingdom from behind the high walls of her castle. In 1930, Doug met Lady Sylvia Ashley and began an affair that, three years later, resulted in his and Mary's divorce. Hollywood's golden couple was done. Doug went on to marry Sylvia and a year later, Mary married band leader Buddy Rogers. In 1939, Doug died in his sleep of a heart attack. Though Mary died many years later (1979) after being married to Rogers for 40 years, it was believed that they both still loved each other till the end, always regretting their inability to reconcile. Of course, this could also just be wishful thinking on behalf of their fans and of those who want to believe in Hollywood happily-ever-afters, I know that's where my sentiments lie.